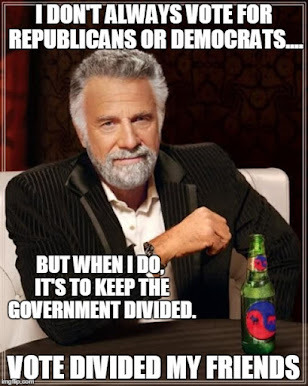 The Dividist Papers: When Bipartisanship Happens to Good Partisans A meditation on debt ceilings and deficit reduction. A meditation on debt ceilings and deficit reduction. "A new Pew Research poll finds 68% of Americans say that lawmakers should compromise on the debt ceiling debate, even it means striking a deal they disagree with. Just 23% say lawmakers who share their views should stand by their principles, even if that leads to default." "A majority of Americans disapprove of the deal struck Sunday by President Barack Obama and congressional leaders that will raise the country's legal borrowing limit, and three out of four believe elected officials have acted like "spoiled children." Since that legislation was signed, nothing but cries, lamentations and the rending of garments has been heard across the land. The animus from the right, left and center for the debt ceiling compromise is quite extraordinary. Q&O had a good survey of the early reaction and little in the popular assessment has changed in the weeks since. Congressional and presidential approval levels plunged to new lows. When describing the debt ceiling deal and the process and the process to get there, the pejorative of choice is : Our government is... OMG ! DYSFUNCTIONAL! And it must be true. I mean ~750,000 Google search hits on "debt ceiling dysfunctional" can't be wrong. Who am I to argue with that? But maybe, just maybe - dare I say it? Our government is working exactly as it was designed to work, and our representatives are doing exactly what we, the voters, sent them to Washington to do. For all of the lip service paid to the virtues of bipartisan compromise from pundits and bloggers across the political spectrum, there appears to be very little support for a picture perfect example of a bipartisan centrist compromise when Congress does enact one. There is simply no way to characterize this vote except as an overwhelming bipartisan compromise victory. Moreover, to the extent that “Centrist” actually means anything in concrete policy terms, this was a purely Centrist piece of legislation. The extremes of both parties voted against it. It required a bipartisan coalition of more moderate, centrist, practical Democrats and Republicans to pass this legislation. Liberal votes were not needed. Tea Party votes were not needed. It passed overwhelmingly. It is exactly this model that future deficit reduction legislation will follow. Don't get me wrong - to call it weak gruel is to give this legislative stew more flavor than it deserves. It does not solve the deficit problem. Not even close. However it did accomplish several difficult objectives. It started turning our ship of state toward a course that will solve the problem. It started the process of making difficult cuts. It put a mechanism in place that can and will take more meaningful steps toward solving the problem. It erected an artificial deadline for a solution to be enacted by Congress, which is a necessary if not sufficient condition for our Congressional leaders to make the hard deficit decisions they face between now and the end of the year. In short, it offers real hope for the first meaningful steps toward fiscal sanity in decades. Navigating the Titanic at full speed through an iceberg field is a tricky proposition at best. The steps taken in the debt ceiling compromise were considered significant enough that two of the three rating agencies immediately reaffirmed our AAA status. S&P is the odd man out (I'll have more to say about S&P in a future post). Fitch has since reaffirmed our AAA status with no expectation of a downgrade. Moody's does not appear inclined to follow S&P. So with our "dysfunctional" Congress at the helm, our ship of state managed to dodge two icebergs and glanced off a third. We are still floating, we've throttled back and we are on a course that may steer us clear of any more icebergs. A course correction to the predominantly One Party Rule excesses of the last 10 years by a divided government that has been in place less than 10 months will be neccessarily incremental. It cannot be otherwise. No one could or should expect otherwise. The fact that neither you or I or the rest of the passengers on this ship particularly liked the compromise nor the embarrassing partisan performance by the captain and crew does not change what it is – and it is a picture perfect example of a bipartisan centrist compromise. If you don’t like it, you may just not like bipartisan centrist compromises as much as you think you do. And you probably will not like the bipartisan centrist compromise that will almost certainly be delivered from the Deficit Reduction Committee at the end of this year. Conventional Wisdom in both main stream and non-traditional media have passed judgement on the debt ceiling legislation and the bipartisan deficit reduction super committee it begat. Conventional Wisdom informs us that we have seen this movie before and we know how it ends. Conventional Wisdom tells us the bipartisan Super Committee will fail. It will fail just like the plan formulated by the Simpson-Bowles committee, just like the bipartisan plan formulated by the Gang of Six Senators, and just like the bipartisan "Grand Bargain" negotiation between President Obama and Speaker of the House Boehner. There is no point in holding out hope, the judgement of Conventional Wisdom has been rendered. This is an exercise in futility. Problem being - Conventional Wisdom is wrong. The Simpson-Bowles committee recommendations are alive and well. They were the starting point for the Paul Ryan proposal. They were the basis for the bipartisan Senate "Gang of Six" proposal. They were the basis for the Obama/Boehner "Grand Bargain" which came within a relatively trivial $400B revenue gap of being enacted. With each iteration it gets closer to passing. To put in in the parlance of Vice President Biden, this is a BFD. An important, extraordinarily difficult compromise between two wildly different views of the role of government is in the offing. It is perfectly understandable and desirable for our leadership to take the time and go through the pain, partisan histrionics, and debate to be sure we solve the problem and get it right, or at least as close as we can get in our divided country. Conventional wisdom also informs us that Tea Party intransigence on taxes and Liberal intransigence on cutting entitlements will doom the Committee. The membership of the committee are too partisan and too ideological. As in Nick Anderson's cartoon (above), there is not enough room between those partisan big gun for the real compromise we need. The die was cast in the debt ceiling vote. 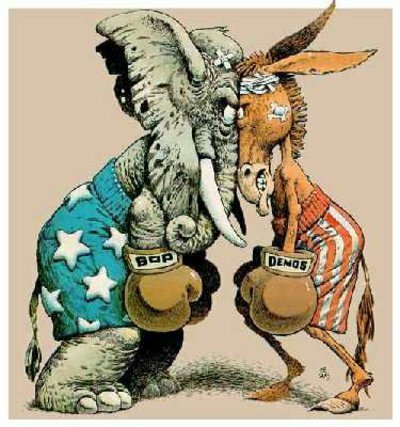 Neither Liberal nor Tea Party votes were needed then nor will they be needed to secure a large bipartisan centrist majority in a future vote. The die from that vote was not broken and it will be used again to cast and forge a deficit reduction bill. Historical precedent informs us that the key element needed for congressional productivity is in place to forge and pass a compromise. That element is an American public demanding change. David Mayhew demonstrated in his seminal work "Divided We Govern" that there is no correlation between congressional productivity and a single party united vs. divided government. However, he also showed there is a correlation between a "palpable public mood for change" and congressional action. 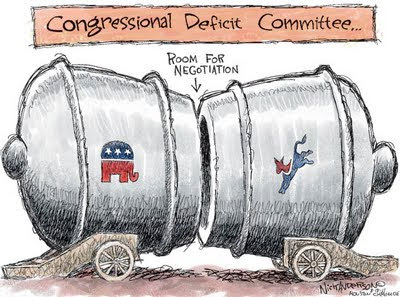 The public demand for a bipartisan deficit reduction deal does not get much more palpable than we are seeing now. It is baseball bat to the head palpable. Even our Congress will have to notice. This public mood meets the Mahew criteria that produces congressional action. This is an easy prediction. We are going to have a Grand Bargain/Simpson-Bowleish bipartisan deficit reduction deal. It is going to happen and it is going to happen before the end of the year. DIANE SWONK: I think, actually, at this stage of the game, the best thing that Congress and the president can do is lay out the long-term plan for our fiscal solvency in the United States. That may leave some room for additional fiscal stimulus in the near term, but if we know what the long-term cuts are and the changes to the tax code will be over the next 10 to 15 years00 we're in uncharted territory. Businesses need to know what the path is. As long as they know that, even if the path is rocky, they can deal with that. They can deal with some level of certainty if they're given it.. And I think given some level of certainty, we'd see that confidence rise a little bit, even if it's a tough road ahead. We know it will be. That's where I think that we can have a biggest impact. Everything else the president's talking about will only act on the margins. Of course, an economy that's only operating on the margin, that's important. VELSHI: ...Stephen, is it realistic to think that if something happens that gives Diane what she is suggesting, that businesses might actually start hiring? STEPHEN MOORE: Yes, it is, except the only difference I'd have with Diane a little bit is I think it matters a lot what that path is. One of the things, for example, that happened, as you know, Ali, this week was that Warren Buffett had that famous piece in "The New York Times" talking about raising taxes on the rich, and President Obama on his magical mystery tour this week has really picked up on that... Let's get the entitlements under control. And as we've talked about many times on this show, now is the time really fix the tax system once and for all. KING: Sometimes, it comes down to a choice. But often, when you're the incumbent, it comes down to a referendum. And people just decide, You promised us something, you didn't deliver, we're going to try something new, even that something new looks a little risky. In the debate over jobs you were just mentioning -- you know, a lot of people out there will say, Well, why can't these politicians get along? The American people bear some reasonability for this. In 2010, they elected a president -- left of center, who came to Washington, who said, Government must take a bigger role in people's lives -- in helping the economy. 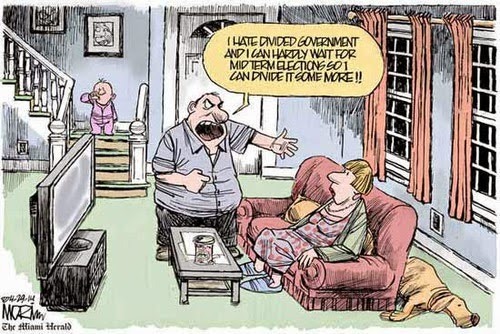 Then in 2010, they sent in a new Republican majority that said the exact opposite, that government is the problem. And so you have this -- this isn't just ugly politics. This is a competition of some big ideas..."
We have a divided government because we have a country that is deeply divided on the big question of the proper role of government and holding wildly divergent views on the best way to deal with our unsustainable spending and debt addiction. In those circumstances compromise does not arrive from a genteel "Council of Elrond" meeting of the minds in dispassionate discussion of our elders, wizards, elves, Democrats and Republicans. Under these circumstances compromise can only come out of conflict between the opposing camps and result in a solution that will be unsatisfactory to both. Under these circumstances compromise can only be achieved under the threat of dire consequences where the political pain of not acting is greater than the political pain of acting. Under these circumstances compromise can only be achieved at the eleventh hour with a hard deadline. All of the circumstances needed for a successful compromise by the end of the year are in place. And they were put in place by the Debt Ceiling legislation. Regardless of whether the debt ceiling "crisis" was "manufactured", it put the elements in place for real deficit reduction deal this year. The debt ceiling "crisis" had conflict, dire consequences, a deadline , and an electorate demanding action. It was perfectly predictable that a bipartisan compromise would be reached. The debt ceiling legislation created a more manageable vehicle for that same conflict, complete with a deadline, dire consequences, and most importantly an electorate that is even more demanding of a bipartisan compromise. Consequently, this committee will develop a bipartisan, centrist, compromise solution built on the foundation of the Simpson-Bowles recommendations. It will have deep spending cuts across the board including defense and entitlements, and it will raise revenues under the cover of tax reform. It will pass at the last minute accompanied by partisan rancor and gnashing of teeth. And you still won't like it.